The Miami Dolphins‘ Thursday night defeat was tough on everyone involved after the Dolphins performed poorly in all phases of the game on their way to a 40-0 pounding at the hands of the Baltimore Ravens. 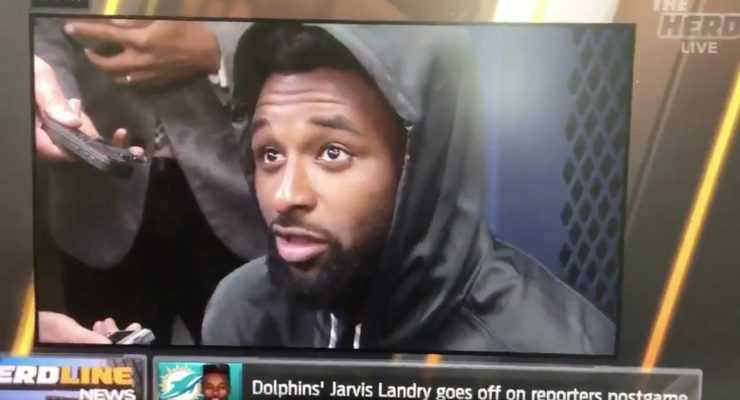 The disappointment star wide receiver Jarvis Landry felt regarding the loss was made very clear when he got in a reporter’s face and yelled profanities during a post-game interview. Landry can first be seen trying to respond to questions despite his clear anger. Later in the video, however, an inaudible question gets the better of Landry as he stands up and immediately calls an end to the interview. Landry suffered his worst game of the 2017-18 season on Thursday, with five receptions for just 33 yards. Clearly, the frustration took its toll. Everyone in the Dolphins’ organization likely felt a similar way following the embarrassing defeat. They will now have to put the loss in behind them, however, and begin preparing for their Week 9 matchup against the Oakland Raiders.